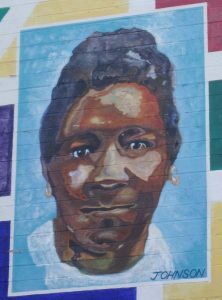 February is Black History Month and in honor of this tradition let us explore the Cleo Murdoch Center Mural & the Stories behind the images. While driving down Butler Avenue in Flagstaff, AZ, it would be hard not to notice the big and beautiful mural on the side of The Murdoch Center. However, how many of us actually know the history behind this mural, the building it is painted on, and its significance to Flagstaff history? In this article, we are taking a look at the Murdoch Center mural and the stories behind its images. The bulk of our Flagstaff histories are written from the white male perspective, and sometimes the influence of other ethnicity’s and genders are either lost or overshadowed. By exploring the history of the Murdoch Center mural, we are helping to shine a light on the important histories on Flagstaff’s early Hispanic, Basque, and Black residents. 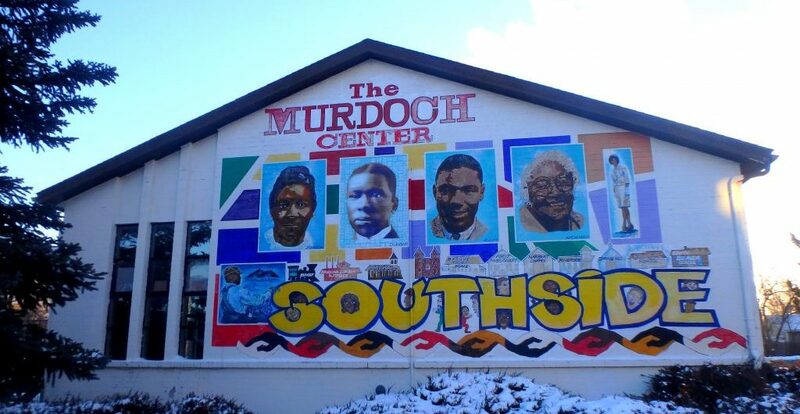 At first glance, the mural on the side of the Murdoch Center is fairly simplistic; with just a couple portraits and an ode to the Southside community. But as you really study it, the many pieces reveal themselves and a whole new history is uncovered. Let’s work through all those pieces and discover the individual stories. DID YOU KNOW: The image of a Black lumber worker is an artists rendition of this photo taken in 1947 at the Southwest Lumber Industries. 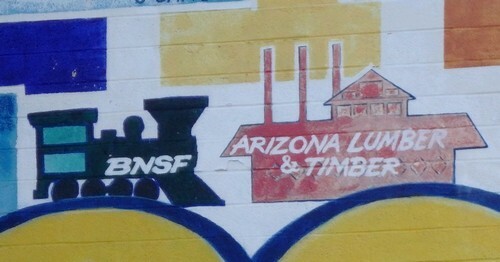 BNSF & Arizona Lumber & Timber Co. Many of Flagstaff’s earliest residents came to the budding northern Arizona town to either work for the railroad or one of the various lumber companies, including the BNSF and the Arizona Lumber & Timber Co. These early residents were of all backgrounds: Chinese, Irish, German, Black, Hispanic, Latin American, English, Native American and just about anything else you can think of. This tradition would continue all the way up into the 1990’s when the last lumber mill shut it’s doors. Since then, the more diverse communities in Flagstaff have become less populous and prominent but the unique influence and essence that they created, continues. With the early diversity among Flagstaff residents, came two sides of the same coin. One side of acceptance and a community of folks, regardless of race and religion, coming together to build and establish a new town. The other side one of racial tension and the divisiveness and fear that comes along with it. This became especially true as the ideology of the U.S. as a whole, and particularly the South, began to seep into the American Southwest. Where it had previously been less prominent and pervasive. For the first couple of decades of Flagstaff’s development, racial tensions were present but it was as a whole an integrated community. However, as national tensions grew so did those in Flagstaff and by 1909 segregation in Arizona and our town was in full force. Segregation was now mandated in schools, as well as practiced in many other establishments such as churches, theaters, restaurants, and stores. This segregation would have many negative effects on the community, but it would also foster the development of very rich and tight knit communities among Flagstaff’s Hispanic and Black residents. The segregation within the communities of Flagstaff became most apparent during and after WWII when the Camp Navajo Ordnance Depot was built outside of town and Flagstaff became a hot spot for lumberjacks. During the 1940’s the population of Flagstaff essentially doubled, and a majority of the workers were minorities. This included a large number of Black lumber workers from the South who were migrating to Flagstaff and the surrounding areas to take advantage of stable, well paying jobs at the mill, and often to escape the growing racial tensions of their home states. As the varying populations grew in Flagstaff, so did the presence of their distinct communities. Present day downtown and what we typically consider the center of early day Flagstaff, sits north of the railroad tracks. In the very early days, there would have been business owners and residents of varying backgrounds within this quarter but as time went more distinct neighborhoods, often based on race or social class, were established. As this happened, the railroad tracks became a sort of natural barrier with the white populations to the north and the non-white populations to the south. In general, here are a couple neighborhoods, though certainly not all, that highlight this separation. The Southside neighborhood was established primarily by Flagstaff’s early Black residents, but it also had portions dedicated to the Hispanic and Basque populations. La Plaza Vieja is actually a remnant of the very first neighborhood in Flagstaff, but after downtown was developed it was established by the early Hispanic residents. Los Chantes was another primarily Hispanic neighborhood and acted as employee housing for the Arizona Lumber & Timber Co. Among some of the other neighborhoods separated by race were, and in some ways still are, Sunnyside, Siler Homes, and Brannen Homes. 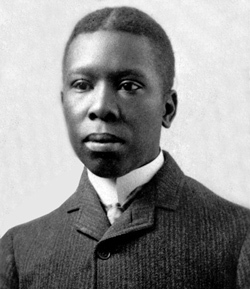 DID YOU KNOW: Dunbar School was named for Paul Laurence Dunbar who was a famed Black poet, essayist, and playwright. He was born to an escaped slave and went on to publish a great number of popular works. Among his best-known achievements was his play In Dahomey (1903), which was the first all-African American play on Broadway. As we mentioned previously, segregation in schools became required by law in Flagstaff in 1909. For the first couple decades, the students still attended the same school, Emerson School, but they took their lessons in separate classes. However, by the 1920’s and 30’s residents were forced to move the students to separate buildings entirely. The Dunbar and South Beaver Schools were the result. The Dunbar School was located in the building that is now home to the mural that we are discussing in our blog today. It was built in 1927 for Flagstaff’s Black community and it operated until 1952, when segregation in Flagstaff finally ended. The school taught grades one through eight and the first teacher and president was named Effie Autry, followed by Mrs. Cleo Wilson Murdoch who was a high school graduate of Winslow High School. When Mrs. Murdoch died in 1940, the school was left without leadership until after WWII when the position was taken by Wilson Riles. Wilson Riles was born in Louisiana and, after he was orphaned, moved to Flagstaff with his foster family. Upon arrival in Flagstaff, he had met Mrs. Cleo Murdoch and as a result he was inspired to attend the Arizona State Teachers College (now NAU) and become a teacher. He did just that, and as the only black student in his class he graduated with his certificate in 1940. 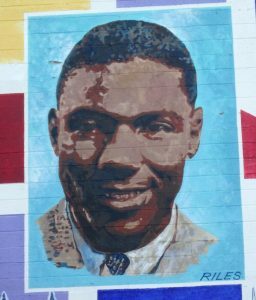 Over the next several years, Riles worked as a teacher at an all-black school in Pistol Creek, AZ, then as principal of a school in McNary, AZ, and as a member of the Army Air Corps during WWII. After retiring from the Army, he then returned to Flagstaff and took the position as president of the Dunbar School that had been left vacant by the death of Mrs. Murdoch. Mr. Riles is credited with reforming the school for the duration of its operation, and for the positive educational experience of Flagstaff’s young minds. In the early 1950’s, Riles began working very closely with the superintendent of schools, Sturgeon Cromer, to abolish segregation in Flagstaff. Their efforts would prove fruitful, and by 1952, going against state law the town once again integrated their schools. The elementary students went to South Beaver School and the 7th and 8th graders went to Flagstaff Junior High. DID YOU KNOW: Tilda Mae Johnson was a teachers at both the Dunbar and South Beaver Schools. She generally taught first grade and kindergarten. In 1971, Wilson Riles moved to California where he became the Superintendent of Public Education for the state, which was the first statewide public office position to be held by a Black person in California. The Riles Building on NAU campus is named in his honor. The Cleo Murdoch Community Center, which is of course home to the mural we are discussing today, is the only remaining portion of the Dunbar School. The rest of the school was demolished in the expansion and creation of Butler Ave. In the 1970’s, the City of Flagstaff purchased the old Dunbar School buildings and created the Murdoch Center, a recreational facility for the neighborhood. It was named in honor of Mrs. Cleo Murdoch, whom we met earlier. When the City of Flagstaff decided to sell the property due to a lack of use, the community rallied and the Southside Neighborhood Association bought the building and preserved it for future generations. The new and improved Murdoch Center was reopened in 2008 as a cultural center and it has stood as an important part of the pulse of the Southside neighborhood ever since. DID YOU KNOW: Joan Dorsey born and raised in Flagstaff and attended the segregated Dunbar School as a child, but her dreams would take her away from home. In 1964, Joan Dorsey was hired by American Airlines as the first black flight attendant in the United States. Although Joan left Flagstaff, her family’s legacy is still present. Her niece is Flagstaff Mayor Coral Evans. South Beaver School is another example of school segregation in Flagstaff, and it was built primarily for Flagstaff’s Hispanic and later Black children. The school was completed in 1935 and opened in 1936. As we learned earlier, the elementary students from the Dunbar School came to South Beaver after Flagstaff desegregated in 1952 and after a fashion it became a complete desegregated school. In 2010, South Beaver shut down it’s regular operations and became FUSD’s first Magnet School before closing down entirely in 2015. The building has since been purchased by NAU and now houses the university’s intensive English Program. During the first half of the 20th century, segregation was everywhere: schools, theaters, restaurants, and yes, even within the town’s churches. The result is some of Flagstaff’s most beautiful buildings, that remind us of this dark time in U.S. history, but also of the true community that was developed by the towns minority populations at the time. These churches became important centers for the Hispanic and Black communities. Our Lady of Guadalupe (224 S. Kendrick St.) was built in 1926 to serve Flagstaff residents of Hispanic or Latin American descent. The buildings construction was long and ran into financial issues several times along the way, but its future parishioners rallied their time, money, and resources to see it completed. As the building was nearing completion, Flagstaff residents were preparing for the Feast of Guadalupe, which is celebrated on December 12th, and so the church was named Our Lady of Guadalupe. The blessing of the church’s bell took place on December 5th and the first mass was help in Spanish on December 12th, 1926. Over the years, Our Lady of Guadalupe would also become frequented by Flagstaff’s Black Catholic residents. La Iglesia Metodista Mexicana El Divino Redentor is another early Flagstaff church that served the rich and family-oriented, Spanish-speaking communities. It was built in 1892 and is located at 319 S. San Francisco St.
Flagstaff’s Black community primarily resided in the Southside neighborhood of Flagstaff and four important churches remain as an homage their community. The First Missionary Baptist Church (219 S. Elden St.) was built in 1939 and there is also the Riverside Church of God in Christ (419 S. Verde St.), the Spring Hill Missionary Baptist Church, and the Harbert Chapel African Methodist Episcopal Church (424 S. San Francisco St.) Katherine ‘Mother’ Hickman, whom we will meet below, was likely one of the founding members of the Harbert Church which was built in stages as funds allowed. The backside of the building shows old brick, the remnants of the original building, and the white, front structure is part of the newer building. 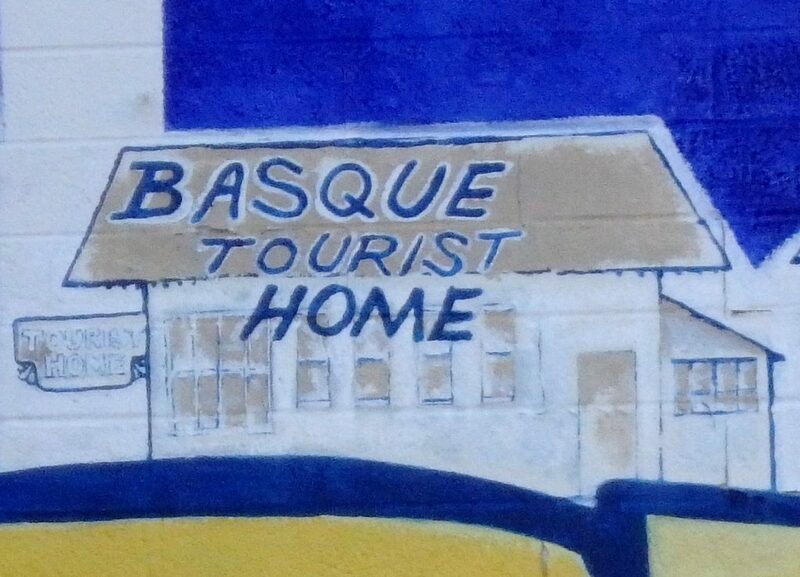 We already discussed how the Southside neighborhood, was in reality a group of neighborhoods all in one, and one of those small slices contained Flagstaff’s Basque population. The Basque’s in Flagstaff were primarily sheepherders and they would travel across the landscape in accordance with the seasons. The Basque herders would summer in Flagstaff before migrating towards warmer climates in the winter, and it was common to build community homes in areas they traveled frequently. One such community home was built in Flagstaff and it remains today. The Tourist Home was erected in 1926 by Isabelle Garcia and her son Jesus and it served as a boarding house for the Basque community. The building we see today was purchased and renovated by local entrepreneurs and turned into a wonderful restaurant. However, it sat empty for four or more decades before this revival. One of our favorite features of the Tourist Home is the Pelota Fronton, or hand ball court in the back of the building. The area surrounding the Tourist Home was also the home to a small community of Basque residents in Flagstaff throughout the 20th century. 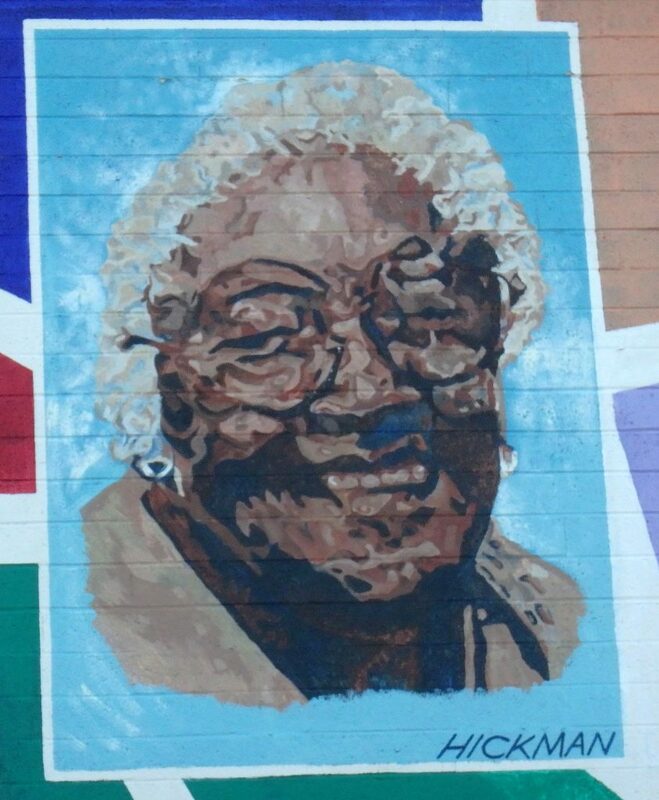 The last portrait from the Murdoch Center mural that we will learn about, is that of Katherine “Mother” Hickman. 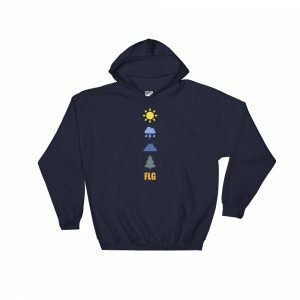 Whose contribution to the community of Flagstaff, and especially of its youth is very present today. For a more complete description of the legacy of Katherine Hickman, visit this article on the AZ Daily Sun, but we will do our best to summarize some of her most important accomplishments here. Hickman and her husband, Sanders, arrived in Flagstaff in 1946 from Louisiana. Much like many of Flagstaff’s Black residents at the time, they came to seek employment with the area sawmills that were offering higher pay and more stable jobs than in the South. And far less racial tension. Katherine was a high school graduate and a devout member of her church, and so she valued highly the importance of both in a community and especially among its children. It is apparent that Hickman played a large part in the development of some of Flagstaff’s churches as well as the education and well being of Flagstaff’s under-served children. This devotion led her to work with the Cogdill Recreation Center in the 1960’s to offer a regular story hour for Southside children, and this decision would inadvertently lead to the development of the Flagstaff Head Start Program. The program quickly grew from its modest roots into a full-fledged program and today it encompasses an enormous amount of assistance for less advantaged children. In the writing of this article, these words hit us hard. As they are the root of everything we have written here. The history of Flagstaff’s residents, European, Black, Hispanic, Basque, Native American, it all can seem so separate, but yet it’s not. It truly is the same story told from different perspectives, and just as it’s so important to remember history from different perspectives. Just as much as it’s important to create our future this way as well. As we close out this article, let’s just remember one thing: “You’ve got to have love.”, and everything will be okay.